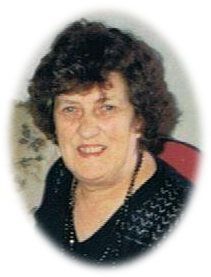 Finlay Valerie (nee Thompson) 15th April 2019, peacefully at Hospital, late of Doury Road, Ballymena. Wife of the late A. Finlay and dear sister of James and the late Hugh, Victor and Andrew. Funeral service in St Patricks Paris Church, Ballymena on Thursday 18th inst. at 12noon, cremation afterwards at Roselawn. No flowers please, donation in lieu, if desired, may be sent to James Henry Funeral Services, 100 Broughshane Street, Ballymena BT43 6EE for N.I. Children’s Hospice. Lovingly remembered by her sorrowing brother James, sister-in-law Elizabeth and family circle.